This book explores the often-assumed but so far not examined proposition that a particular US culture influences US foreign policy behavior, or, more concretely: that widely shared basic assumptions embraced by members of the US administration have a notable impact on foreign policy-making. Publicly professed beliefs regarding America’s role in the world and about democracy’s universal appeal – despite much contestation – go to the heart of U.S. national identity. 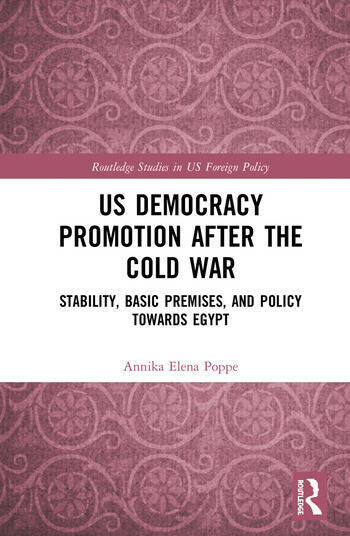 Using the case-study of US-Egyptian bilaterals relations during the Clinton, Bush junior and Obama administrations, it shows that basic assumptions matter in U.S. democracy promotion in general and the book operationalizes them in detail as well as employing qualitative content analysis to assess their validity and variation. The research presented lies at the intersection of International Relations, U.S. foreign policy, regional studies and democracy promotion. The specific focus on the domestic ‘cultural’ angle for the study of foreign policy and this dimension’s operationalization makes it a creative crossover study and a unique contribution to these overlapping fields. Outlook: is there potential for change on the horizon? Whither to, democracy promotion in (post-)Trump America? Annika Elena Poppe is project director and senior researcher at the Peace Research Institute Frankfurt (PRIF). Her research focuses on international democracy promotion, U.S. foreign policy, and the global phenomenon of shrinking civic spaces. She is coordinator of the German research network "External Democracy Promotion" (EDP), member of the International Consortium on Closing Civic Spaces (iCon) hosted by CSIS, and has worked as a consultant for the German Agency for International Cooperation (GIZ) in 2016-2017.